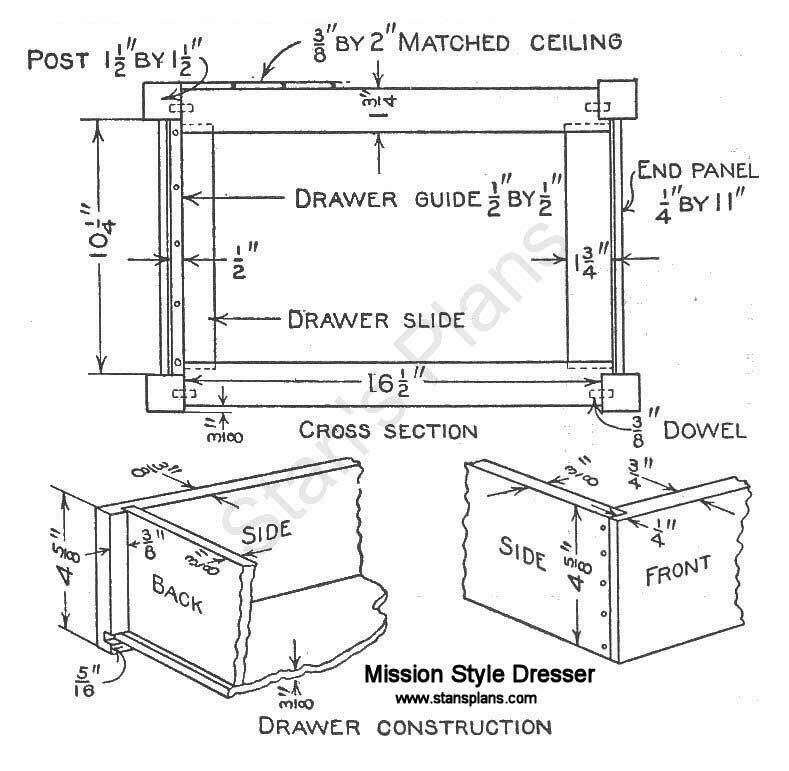 Build a unique mission style dresser with free plans. Very traditional looking. 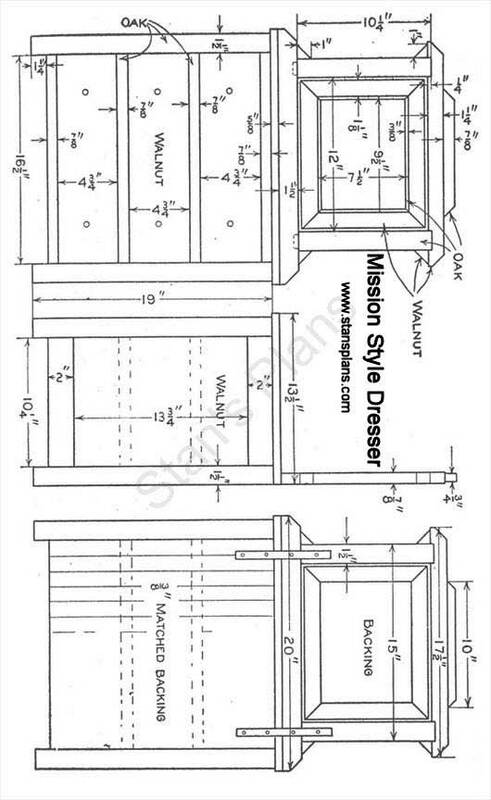 Click here for detailed mission style dresser plans 1. This dresser can be made of two kinds of wood as marked on the drawing or it can be made all of one kind. 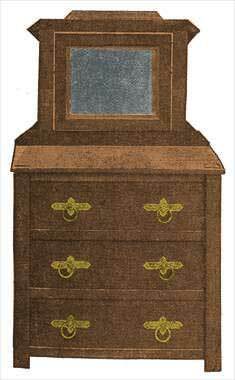 The original dresser was made of oak and walnut and was finished natural, the contrast between the light and dark woods adding interest to the piece. Sandpaper all surfaces that show. 4 oak posts, 1-1/2 in. square by 19-1/2 in., S-4-S.
3 walnut drawer fronts, 3/4 by 5 by 17 in., S-2-S.
6 yellow poplar drawer sides, 3/8 by 5 by 12 in., S-2-S.
3 yellow poplar backs, 3/8 by 4-1/2 by 16-1/2 in., S-2-S.
3 yellow poplar bottoms, 3/8 by 12 by 16-1/2 in., S-2-S.
4 oak front stretchers, 7/8 by 1-3/4 by 17-1/2 in., S-4-S.
4 oak side rails, 7/8 by 2 by 12 in., S-4-S.
2 walnut side panels, 1/4 by 11 by 14-1/2 in., S-2-S.
8 oak drawer slides, 7/8 by 2 by 10-1/2 in., S-2-S.
6 oak drawer guides, 1/2 by 3/4 by 10-1/2 in., S-2-S.
4 oak back stretchers, 7/8 by 2 by 17-1/2 in., S-2-S.
1 oak top, 5/8 by 14 by 20-1/2 in., S-2-S.
3 sq. ft. of 3/8 in. matched yellow pine ceiling for back. 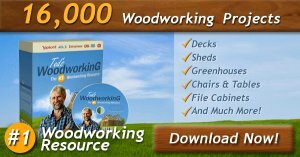 1 walnut piece, 7/8 by 1-3/4 by 20-1/2 in., S-2-S.
1 walnut piece, 7/8 by 1-1/2 by 18 in., S-2-S.
1 oak piece, 3/4 by 1-1/4 by 10-1/2 in., S-2-S.
2 oak pieces, 7/8 by 1-1/2 by 11 in., S-2-S.
1 walnut bracket piece, 7/8 by 1-1/4 by 5 in., S-2-S.
2 walnut pieces, 7/8 by 1-1/2 by 12-1/2 in., S-2-S.
2 walnut pieces, 7/8 by 1-1/2 by 10-1/2 in., S-2-S.
2 oak pieces, 1/4 by 3/8 by 10 in., S-4-S.
2 oak pieces, 1/4 by 3/8 by 8 in., S-4-S.
1 back, 3/16 by 8 by 10 in., soft wood. 2 cleats, 3/8 by 1-1/4 by 8 in. 1 plain mirror glass, 7-1/2 by 9-1/2 in. Begin by planing the four posts to length. The lower ends should be slightly beveled to prevent their slivering. Cut the mortises for the tenons that are on the ends of the side rails. These rails are to be 7/8 by 2 in. and the tenons should be 3/8 by 1-1/4 in. wide by 3/4 in. long. The posts should be rabbeted down to their middles to a depth of 3/8 in. so as to receive the 1/4-in. end panels. The end rails should be cut to length and their tenons worked after one edge of each has been rabbeted as were the posts. Having squared the panels to size, put the two ends of the dresser together with glue. Next make the four frames which are to carry the drawers. They should measure from outside to outside, in length 17-1/2 in. ; in width, 12-1/2 in. It is intended that the short pieces shall be tenoned into the long ones. When these frames are ready, cut out each corner as indicated in the cross section drawing. Reduce to size the drawer guides and fasten them in place. Dowel the frames to the ends of the dresser in the places indicated on the drawing. Put on the back, nailing into frames to the ends of the dresser in the places indicated and fasten the top in place, putting screws into it from the under side. The mirror frame and support should next be made. The drawing shows quite clearly the parts and their relation to each other. All the slopes are of 45 deg. Instead of rabbeting the mirror frame, a 1/4 by 3/8-in. fillet of oak is nailed around to form the recess, the walnut frame and oak fillet making a pretty contrast. All nail holes are to be filled with putty colored to match the finish. Wooden pins or round-head screws are to be used to fasten the mirror frame to its support and should be placed above center an inch or so. The drawers are to be constructed in the usual manner. It is a good plan to make the grooves 1/16 in. narrower than the stock is thick to insure a fit, chamfering the under or back sides of the bottom and back if necessary. Make the sides of the drawers of such a length that when the drawer has been pushed in as far as it will go, the front will be recessed about 1/4 in. behind the front crosspieces. Groove the inside of the drawer front 3/16 in. to receive the bottom. The mirror should not be placed until the wood has been finished. Finish the wood natural, apply three coats of varnish. Rub the first two with haircloth or curled hair and the last with pulverized pumice stone and crude oil or raw linseed oil. This gives an egg-shell gloss. For a dull finish, rub the varnish after it has become bone dry with pulverized pumice stone and water, using a piece of rubbing felt. Rub until the surface is smooth and even, and clean with a wet sponge or chamois skin. If a polished finish is desired, rub first with pulverized pumice stone and water, then with rotten stone and water. Finish with a mixture of oil and a little pulverized rotten stone.